I love James Peterson for breaking things down so simply. Now if only he or someone else (you?) could explain the difference between crème caramel and caramel flan to me, I would sleep so much better at night. No matter–at the moment, I just want to learn to do this right, by any name. Today, the le sauce baking academy tackles whatever it is that’s described above. First up, a savoury custard (surprise). This is a baking academy, and I’m interested in learning about temperature and cooking time, so although the recipe below originally calls for steaming the caramel on the stove, I chose to bake it and pay attention to how long it takes for caramel to set at a moderate 350F degrees. The recipe calls for this custard to be “lightly set”, different than my family’s caramel flan which is creamy but semi-firm. The latter is also served cool whereas this softer custard is served warm. In the end, 55-60 minutes was the perfect time, in my opinion, to tear this custard from its steamy bath. It does need to cool slightly to be safely edible, say, 5-10 minutes, which is just long enough to throw the tomatoes, which caramalized and were removed from the oven at least 20 minutes earlier, back into the warm oven to heat up a little. The thing that surprised me the most about the custard was not the flavour but how silky smooth it was. It was exactly the texture of silken tofu, hot and almost soothing. 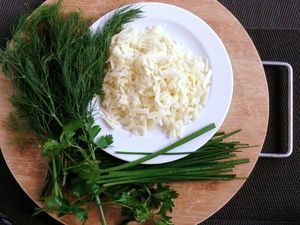 It was infused with a savoury essence–hints of both the broth and the cheese. The finer you grate the cheese, the more it will disappear into the custard, but a coarse grate provides a little texture to the bottom of the custards too. I hope that you’ll give this, or another custard recipe a try and participate in the the le sauce baking academy. To do so, you just need to leave a comment, tip or question in the comments and do link back to your blog post about custards so we can all learn everything there is to know about them. I swear, if you have the answer to the flan/custard debate, you’ll be one of my heros for life. Whether or not I solve that mystery by then, I’ll be back on the first Tuesday of next month with another recipe and attempt at custards/flans, taking your tips and advice to heart too. Hope to hear from you! YS note: *The original recipe called for the custard to be made on the stove, but I used the baking method from my family’s flan recipe, and baked the custard and the tomatoes at the same time. I made this custard in one large casserole, and I found that though the custard set, there was quite a lot of broth that didn’t evaporate, and I might cut the amount back a little next time. However, I imagine that it would be less of an issue if using individual ramekins, in which case you wouldn’t have to dip into the casserole to serve, which is where things get a little messy. Special equipment: 6 ramekins (or 1 2L ovenproof dish*) and a larger, deep oven-proof dish or roasting pan that your ramekins (or dish) can fit inside. Preheat oven to 350C and boil a kettle full of water. 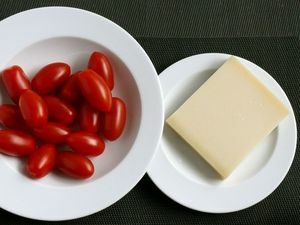 Meanwhile, for caramelised tomatoes, combine tomatoes, oil and sugar in a roasting tray, season to taste and set aside. 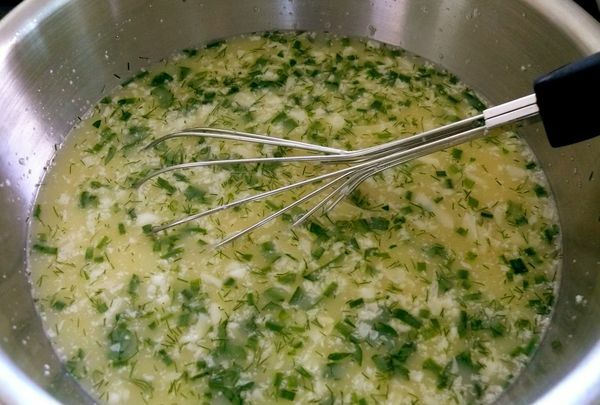 Whisk eggs in a bowl, stir in stock, Gruyère, chervil and ½ tsp fine sea salt. Ladle mixture among six 250ml ovenproof ramekins (or into one large 2L ovenproof casserole). Open the oven, pull the centre rack halfway out and set the large dish with the ramekins (or dish) centred inside it, carefully on the rack. Pour the boiling water from the kettle carefully down one side of the larger dish, until it comes halfway up the outside of the dish(es). Carefully slide the rack back into the oven and close. Bake for 50-60 minutes, until lightly set. 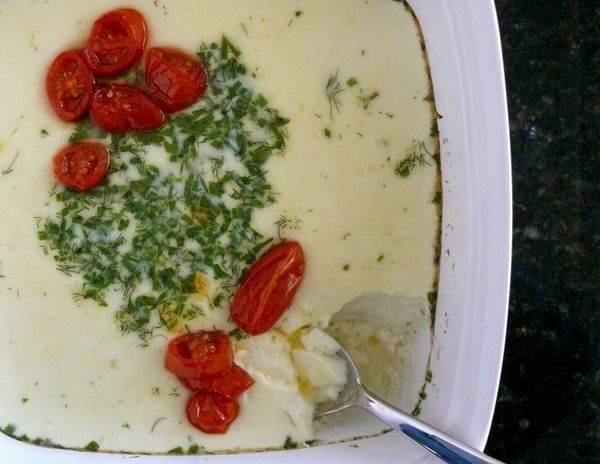 At the same time, add the tray of tomatoes to the oven and roast until caramelized (7-10 minutes). 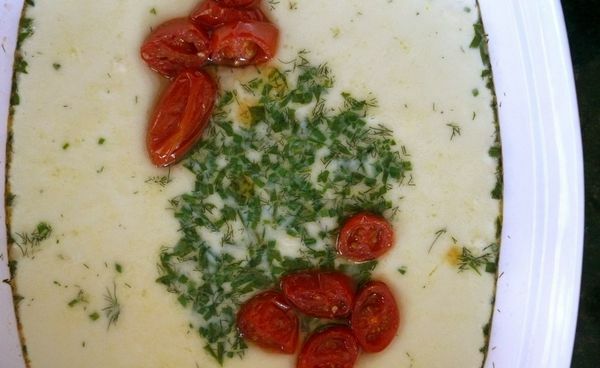 When the custard is done, arrange tomatoes on top and serve scattered with extra chervil. I believe the difference is that crème caramels are less set and therefore more “creamy”…while flans range from a little (French-style) to a lot denser (Spanish-style). I haven’t tried a savory custard before…this looks pretty interesting!